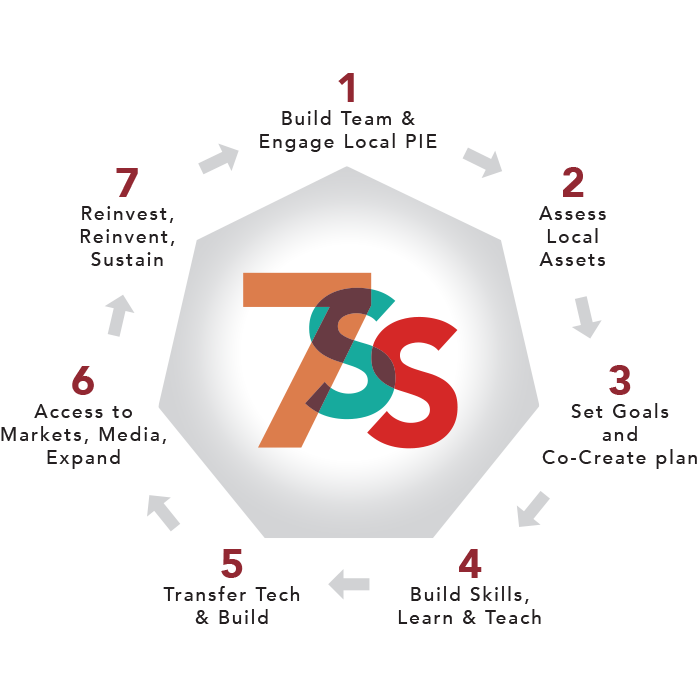 7 Stages to Sustainability (7SS) is a universal road-map for action empowering multi-sector Partners in Empowerment (PIE) to build thriving communities from the ground up. Through 7SS, The Global Summit creates the conditions, community and shared language for collaboration around the year. Using local assets to meet local needs, 7 Stages to Sustainability (7SS) provides a catalytic engine to achieve cross-sector, whole system solutions. Here at The Global Summit, 7SS provides a framework to organize skills-based workshops, and interactive dialogues to move ideas into action. 7. Deepen Impact & Sustain Synergy. – Arthur H. Purcell, Ph.D., Educator specializing in natural resource solutions, former consultant to the UN Economic Commission for Europe. Build a team with an eye on your ideal future. Engage Partners In Empowerment™ (PIE) – citizens, organizations, and businesses dedicated to improving human and environmental security. UNDERSTAND: “How to” find the Ideal Partners, Discover a Common Vision, Self Empowerment, Community Engagement, Participatory Community Development, Leadership, etc. Assess your Assets. Identify sustainable human and natural resources that can be developed to create economic opportunities. KNOW: Local Resource & Asset Management, Self-esteem building, Financial Planning, Resources Exchanges, Currency Systems, etc. Co-Create a Plan. Outline community needs, measurable goals and actions with your team. LEARN: Project Development, Evaluation/ How to Measure Results, Needs-Assessments, Strategic Planning, Time Management, etc. Educate Yourself & Learn from Others. Get the skills you need to get the job done. Support capacity building in project management via vocational skill development and technical training. LEARN: Forums to Exchange skills, experiences and ideas, inspire & support multidisciplinary solutions for your ideal future. Basic training in collaboration & communication techniques, etc. Exchange, transfer & invest in appropriate technologies & critical information in health, energy, transportation, construction, agriculture, water, communications, education, + to add value to your inherent strengths. Integrate & Build. DISCOVER: Appropriate Technology 101, Urban Planning, Green Building & Design, technology transfer, banking & investment, ICT for community impact and more! How to protect your intellectual property, etc. Deepen Impact & Self-Reliance. Create Triple Bottom Line Public-Private Partnerships. LEARNINGS: “How to” Create Multi-sector / Public-Private Partnerships & Win-Win-Win Economic Systems; Sustainable Cities; Innovative Social Businesses modeling Ecosystems, i.e. Bio-mimicry, Fractal, Complex and Emergent Systems, etc. We are looking for Sustainable Results. How do we know we have them?